About The Artist: Jeff Hunter has spent a life time writing singing and composing his original songs while mastering the acoustic guitar. 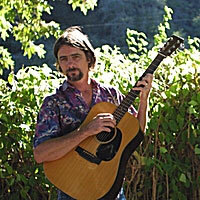 Best known for his years with The Previously Lost Dogs playing there original folk fusion and producing five albums. In the mid 90’s Jeff started another musical project called Fourteen Stings working with world class violinist Denis English and renowned bass player Jack Grosse turning his folk roots towards a jazz swing flavor of what he still calls Folk Fusion all the while composing more original tunes to rock out his dedicated fans. His most recent work includes the release of his first children’s album of music for parents children will love called Elemenope (L M N O P) In the near future Jeff Begins work with a new set of artist in his first rock and roll band called Forest Hunter and the Beast. Stay tuned you never know what this artist will do next, when it comes to music it is sure to be good. Finally a children’s album for parents. 14 years and two kids later award winning songwriter Jeff Hunter releases this long awaited album of children’s songs inspired from his personal experience and the joy of raising his own two kids. Parents will rock out to these hip folk oriented tunes and laugh along with lyrics so true for parents everywhere. Kids will sing along with these imaginative story songs that paint a positive picture of life and learn something along the way.